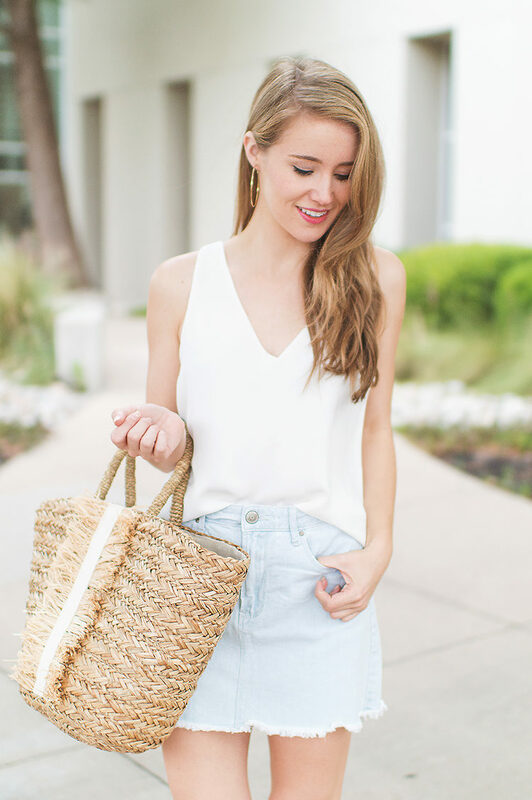 I love switching things up with skirts in the spring, and am so happy to see that denim skirts are back this season! Finding one that has a great fit, color and price point, however, proved to be quite the challenge for me. This is definitely not a look you want to go too tight or short in! I found this one online, and decided to take a gamble! To me, $18 for an easy, wear-with-anything staple seemed worth it. And y’all… I’m so happy I did! I ordered my normal size, 25, and found it fit true to size. If anything, a little loose which I’m actually digging! I can already tell it will be on repeat for the next few months, and it’s currently in my suitcase for Spain! Today is our first full day in Seville, and we are LOVING the warm weather! (It was rainy and cold during our time in Madrid!) We’re so looking forward to experiencing the Feria today! Our first step is finding flamenco dresses…. everyone wears them for the festival! Love the denim skirt! So perfect for May. That’s such a cute skirt! And I love how you styled it so simple and casual. Love this look! I love that denim skirts are coming back in. I love this skirt. It’s the perfect color.